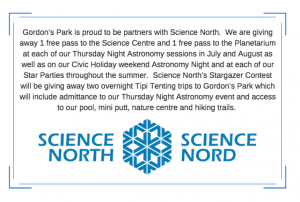 Astronomy is one of our favourite activities at Gordon’s Park. Over the summer and fall we host a series of events and activities that will give you a chance to learn more about the night sky and explore it. Included in these activities are our star parties. Our star parties are perfect for both amateur and veteran astronomers and we have special event astronomy nights happening during each of our star party weekends for those who want to learn more about the stars. Come join us for an incredible astronomy weekend, camping and viewing the night sky in our RASC designated Dark Sky Preserve. Our Dark Sky Preserve offers exceptionally dark skies, no light pollution and 360 degree observing from horizon to horizon. Stargazing Manitoulin is our longest standing star party and our premiere event for being able to view deep sky objects like star clusters, nebulas, galaxies, and planets, including the rings of Saturn. At this years event, happening on Canada Day Weekend, you will have the opportunity to participate in a meet and greet campfire, stargazing hike where you will explore naked eye observing and learn about star hopping. You will also have access to two nights of our public observing session where you will get to look through a telescope in our dark sky preserve to view deep space objects and receive a laser pointed tour of our night sky and learn about constellations and celestial bodies. Public Astronomy Nights will also be happening this weekend for those who wish to come just for the evening. Check out our calendar of events for dates. Our calendar of events is located at the bottom of the page.